The Tenba CC17 Car Case is a padded case primarily designed to carry lighting equipment in a car. 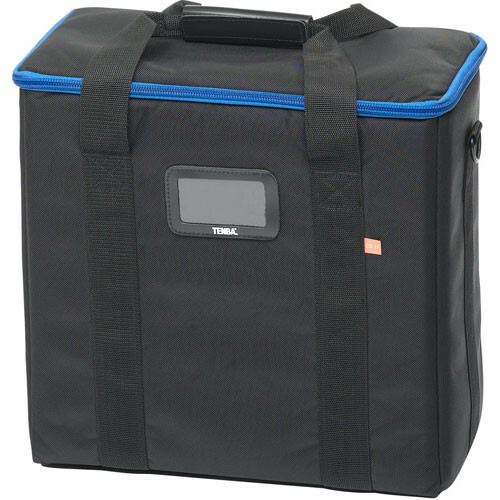 The case utilizes Tenba Safe construction, which is lighter construction than the Tenba Air cases, resulting in a more affordable bag. It is highly resistant to puncture while absorbing and dispersing shock. It includes one movable divider. Padded lighting case designed to be car transportable. Tenba Safe construction is lighter construction than in the Tenba Air cases, resulting in a more affordable bag. It is highly resistant to punctures, while absorbing and dispersing shock. One movable divider is included. Two 2" straps quickly secure your case to any luggage cart without using shock cords, cinching tight with a touch fastener closure. Box Dimensions (LxWxH) 17.5 x 17.25 x 9.0"
CC17 Car Case is rated 4.9 out of 5 by 8. Rated 5 out of 5 by Steve from Perfect for Profoto D2/D1/B1 with glass dome and cap I had been looking for a case that would perfectly fit the Profoto D2's with the glass dome and transport cap on. For those who may not know, by the time you add the glass dome and transport cap on these units, they become about 17 inches long (note that the D2 and B1X are about 1/2 inch longer than the old D1 to begin with). With this case, you can store 3 of these lights comfortably with that stuff on them (stored vertically). Note that the picture of the case here is an older one. The current one looks basically the same, but actually comes with 2 dividers, not one (making 3 sections). It also comes with a nice shoulder strap, and also a zippered pocket on the inside of the lid for keeping instruction manuals, usb cables, etc. So as mentioned you can store 3 lights, or 2 lights with enough room for a couple of full size zoom reflectors (stored horizontally), as well as other configurations like packs and heads, etc. Rated 5 out of 5 by Markiemarkp from Great Product I have just gotten into studio lighting and i needed a bag to carry my 3 mono lights and this bag is perfect.It is light weight and it can carry everything that i need it to and more. All around great product. Rated 4 out of 5 by Tom McKenzie from Super Exactly what I was looking for to carry my D1's. Light weight and much smaller then the Air case for my Compacts. I did add some foam top and bottom. Rated 5 out of 5 by Niken from Case for the Car ! Needed a case that would hold 2 mono-lights,but not the stands.This works for me.I was using a background bag,one can never have too many bags. Rated 5 out of 5 by studiomeyers from Perfect for a Profoto Ring Flash with reflector The dividers in the case are movable which, provides plenty of options for what you can carry in this very stout "car case".? I also have the 22" car case for the beauty dish. ?This case seems to be twice as strong and rugged. ?I'm thinking of picking up a second for misc gear such as reflectors. ?Really well made and it'll be seeing plenty of travel. Rated 5 out of 5 by Dennis from A Very Good Value A good lightweight case with enough room for 2 strobes and room left for cords and accessories. The detachable shoulder strap is annoying so I removed it. Will this hold two Dynalite Baja B4 heads with reflectors? I was able to fit 2 White lightning heads with their reflectors, cords, and grid spots. You may want to take measurements of your gear before you buy.